For nearly a decade, Howard Jones proved that his talents as a vocalist were as immense as his presence on stage. He was the burly, bounding, jovial mouthpiece for a monster of a band. Jones’ departure from Killswitch Engage could have gone in one or two ways. The void could have been filled by many capable vocalists who ply their trade in the genre- All That Remains’ Phil LaBonte being perhaps the most capable of recent times. The replacement would have sufficed; the band’s discrimination would have been of reputable standards and Killswitch would have rolled along with a new singer and all would be well. Yet there was always an intangible factor lurking in the shadows- an entity for which this one role was always suited for. It was a lingering feeling out in the metal ether, a long lost piece of a puzzle that needed time to find its way back. Howard Jones’ voice is meant to fill stadiums, Jesse Leach’s voice is meant to bring them down. Like the phoenix descending, Leach’s return is the shadow filling the canyons once again- a beautiful darkness filling the caverns left behind. His return has not only rejuvenated the band as a whole, but the other members individually as well, with goofy personalities and silly on-stage behavior intact. The fury they exhibited in Alive Or Just Breathing… has returned tenfold, and while the band always seem to be having a great time on stage or on video, the music’s tonality and substance comes from something much darker. From the opening sonic dissonance of “The Hell In Me” to the soaring heights of “In Due Time”, Disarm The Descent is the sound of a band finding cohesion and purpose in near perfect harmony. Perhaps the most telling quality is the complete and lack of contrivance in the songs as one. Modern metal and metal of the “core” designation tend to exhibit a painfully forced quality- whether it be the chugga-chugga riffs, the blasé guitar shrieks, or most nauseating of them all, the gurgling, squealing, catastrophically awful vocals- severely diminishing its appeal. The thing about Disarm The Descent is that when Leach screams, it sounds and feels genuine. Perhaps owing a little to Leach’s personal beliefs, but there has always been a sense of spirituality in his voice, adding to it a piercing quality. Similarly, when he switches from screaming to singing, it’s a seamless transition- like in “All That We Have” and “The New Awakening”. Musicianship has been key to Killswitch’s success- and while technical metal can be overbearing and obnoxious, much of Disarm The Descent’s more complicated measures come in bursts, but all in unison to the melodies and percussion work. The latter of which, proves that Justin Foley is simply one of the best in the business. The pedal work in the closing “Time Will Not Remain” is as good and punishing as you’ll ever hear. There have been many heights to the band’s songwriting over the years, but an apex found is an achievement all bands strive for. 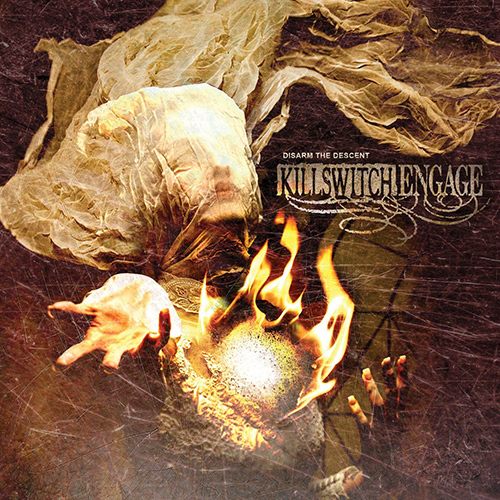 From the earliest incarnations of Killswitch, songs like “My Last Serenade” and “Numbered Days” paved the groundwork to the mass appeal qualities of songs like “Rose Of Sharyn” and the chart conquering “The End Of Heartache”. In the song “The Call”, Killswitch may have found its crowning ode to aurally appealing, destructive metal. It is a song equal parts speed, guttural low-end and machine gun percussion with that soaring grace the band have cornered as their own. Killswitch’s left hand jab was “The End of Heartache” and its right hand knockout punch is “The Call”. Produced as always by Adam Dutkiewicz, Disarm The Descent is sonically the best sounding album since The End Of Heartache. The biggest positive difference; Mike D’s bass work now sounds like the apocalypse. A compliment of the highest possible stature. But as a whole, it is a balance between the elements- something Dutkiewicz and the band couldn’t quite achieve in Killswitch Engage (2009) and for the most part, As Daylight Dies. In “Always”, the band do what most metal bands not from the 80s have a tough time doing- balladeering. Melancholic in craft, the song is by sonic definition, the artwork for The End Of Heartache in its pained vocals, crushing mid-tempo metal and a sense of vulnerability; a song for the heart punctured by the stab of a thousand nails. Leach’s return is as ever, a powerful reminder of the intangible qualities a group of musicians can be together. Disarm The Descent isn’t as big as The End of Heartache, but it’s better. It has a rhythmic cohesion the band managed to blanket with Howard Jones’ monstrous voice and personality for the last ten years. Now, we’ve gotten the album the band couldn’t write after Alive Or Just Breathing… It’s hard to say it’s perfect as perfection is boring, but Leach was never about perfect. He sounds pained and burdened at times, and his voice is his catharsis. There is a darkness in him that battles with the light, on and off the stage. Now darkness has fallen and Killswitch Engage are reborn. Some things are meant to be.